‘We Welfare Society’ a PAN India Registered NGO is merely not just a NGO for Welfare which will give Life, Hope & Support to Millions & Millions of Life in nearby Future. “We Welfare” is an enterprise by alike set of people who believe in contributing their knowledge & strength towards the development of the society. “WE WELFARE” as it is clear by the name is an initiative to mark its contribution towards the Welfare of the Society in many ways which are not restricted till unique topics like, Learn to Care & Respect, Awareness towards Health & Education and The Women (her Safety, Social Welfare) but are very widely gone up to The Tree-Our Life Line, Life after Death-Organ Donation, Blood Donation awareness & camps, Save Girl Child, Taking responsibility of the Senior Citizens and Spreading Laughter. 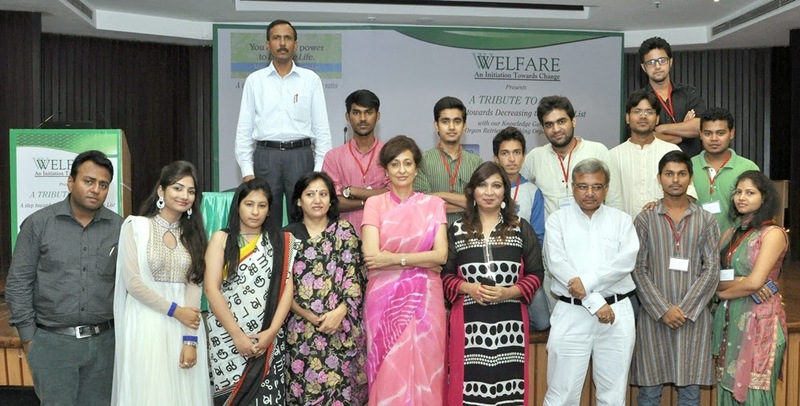 ‘We Welfare Society’ on the eve of World Organ Donation Day organized a high impact interactive event on 6thAugust, 2014 with their knowledge Partners Organ Retrieval Banking Organization( ORBO) and All India Institute of Medical Sciences (AIIMS) at India International Centre, Lodhi Road, New Delhi. The event was presided over by eminent personalities from Medical and Legal fraternity as well as Government sector. The Chief Guest Dr. Julka, Dean at AIIMS and a world renowned Cancer specialist graced the occasion. Dr. Aarti Vij. Head of ORBO, AIIMS, Sh. Ramesh Kumar, SDM and Shri Manish Mohan, Advocate and Central Government Standing Counsel, Delhi High Court were the other prominent dignitaries present on the occasion. The guest invitees included people from Corporate, Social, Legal and Media who attended the event. During the interactive session, the participants raised their queries on various medical, social and legal issues related to organ donation, which were adequately replied to, by Dr. Aarti Vij, Dr. Julka and Shri Manish Mohan. This event was organized with the clear cut aim to spread awareness on various aspects related with the concept of Organ Donation in the Indian society. Dr. Aarti Vij and her associates gave a presentation on the medical aspects of Organ Donation and their Transplantation alongwith their statistical analysis. Dr. Julka apprised the participants with his valuable views on this concept. Shri Manish Mohan, Advocate spoke at length about the legal aspect of this concept. Thereafter, Varchasv Theatre Group presented a short, crisp and extremely touching skit on the concept of Organ Donation, which was loudly applauded by the dignitaries and participants. The event was extremely successful in bringing home the urgent need to make the Indian society aware of the importance of Organ Donation. Ms. Neha Kala, President and Brain behind this NGO and the concept of Organ Donation Awareness thanked the dignitaries and the participants and also assured them that ‘We Welfare Society’ would relentlessly continue to work on the concept of Organ Donation and bring about a notable change in the thought process of Indian Society towards this cause.